Polystichum (Class: Filicopsida, Order: Polypodiales), or shield ferns, as they are commonly called, is a genus of 160 to 200 species. They occur throughout the temperate parts of the world as well as the montane tropics, but are mostly absent from the lowland tropics. There are two distinct centres of diversity; a larger Asiatic centre and a smaller tropical American centre. Both these regions fall within the mountainous tropics characterised by mild, moist climates that are hardly seasonal. Polystichum is generally considered closely allied to Dryopteris, the wood or oak ferns. Shield ferns are characterised by having 1-pinnate to 3-pinnate leaves, which are more developed on the upper side of the pinna-rachis or mid-vein than on the underside. They also have shield- or umbrella-like indusia protecting the developing sporangia. In a number of species, however, the sori lack indusia. Polystichum species mostly occur on the ground, but often also on rocks. They can be divided into two groups; the first has short erect, mostly unbranched rhizomes, sheathed by closely spaced, persistent stipe bases, whereas the second group has longer, prostrate rhizomes, which are frequently branched and the leaves more widely spaced. The rhizomes, like the leaf axes, always bear chuffy scales which become abraded as the leaves grow older. The leaf stalk and main leaf axes are always channelled on the upper side. Depending on the species, the leaves are 1- to 3-pinnate. The leaflets on the upper side of the pinna mid-vein and closest to the lamina axes are always longer and eared. The leaflet margins are mostly strongly toothed and often end in an elongated spine-like tip. The sporangia are borne in round sori, mostly situated in two rows on the underside of the leaflets. When young, the sori are protected by centrally attached or umbrella-shaped indusia, which become shrivelled and darker in colour as they mature. Within each sporangium, 32 or 64 dark brown to blackish spores are formed. Polystichum is poorly represented in Africa, with only 17 species recorded. They are all confined to the eastern mountainous regions of the continent with the Drakensberg being the centre with the highest diversity. Some species occur from near sea level, others are confined to higher elevations, often extending up to 3 000 m.
Polystichum is derived from the Greek word poly meaning many and stichos meaning order or rows. This probably refers to the arrangement of the sori on the leaflets. Shield ferns mostly occur in seasonally moist, evergreen forests, but at high altitudes the plants are generally confined to rock crevices and shaded cliff bases. In these harsh conditions the plants are often exposed to fires and snow. Since the rhizomes are mostly subterranean, these events generally have little effect and plants re-grow rapidly. In spite of the low temperatures which some species are exposed to, none of the African species is seasonally dormant. New fronds are generally produced at, but not restricted to, the onset of summer, especially after the first summer rain. Reproduction is either through spores or by rhizome division. The latter feature generally results in the plants forming clonal stands. Polystichum species, and in particular variations and sports of some European species, were highly sought-after during the Victorian fern craze in the late 19th century. There were 366 named forms of P. setiferum alone. Many of these cultivars are unfortunately now lost. 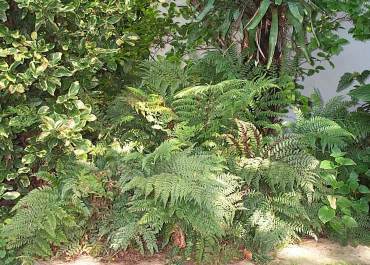 A limited number of shield fern species are available in local nurseries, mostly as house plants. They unfortunately have not become popular garden plants. Rhizomes of various shield fern species have been used since the 18th century as a cure for intestinal worms. Also the Zulu use a decoction of rhizomes from various Polystichum and Dryopteris species as a general anthelmintic. Shade: All the species require light shade, especially during the warmer parts of the day. Direct sunlight in the mornings or late afternoon is generally not a problem once the plants are well established. It is also best to protect plants against strong winds. Moisture: Ferns have shallow root systems and the soil must therefore be kept moist at all times. This is especially important while the plants are still young and not yet fully established. Maintain soil moisture by mulching. Also ensure that adequate humus is worked into the soil before planting. 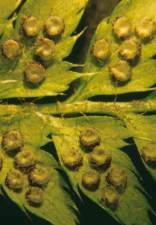 Ferns in general do not require a special feeding programme, but if additional plant food is provided they are quick to respond. This species is confined to the Western and Eastern Cape in South Africa, occurring at elevations ranging between 600 and 1 350 m. Although it mostly occur in forests, it is not confined to them, often forming large stands on road cuttings. As a result of the decumbent and branched rhizome, the species has a shrub-like growth form, reaching a height of up to 0.8 m. The leathery dark green, erect to arching leaves may reach a length of up to 1.8 m, and can be up to 3 times divided. The species is best cultivated in moist, shaded conditions, although it will tolerate some sun once it is well established and the growing medium is kept adequately irrigated. Propagation is best done by rhizome division. The species has a wide distribution in the Old World, extending as far as Japan. It is also widely distributed in South Africa, occurring from the Eastern Cape through KwaZulu-Natal to the north-eastern parts of the Free State, Mpumalanga and the Northern Province. It grows at elevations ranging between 760 and 1 740 m. The species is confined to evergreen forests where it grows on the forest floor or on rocks. P. luctuosum is often sold as P. tsus-simense and is a predominantly single-stemmed species resulting in a tussock-like growth. It can reach a height of up to 0.4 m. This smaller species has a very neat appearance, and is characterised by the almost black scales and dark veins, which contrast with the olive-green leaves. It is best cultivated in shade and needs to be kept moist, but not wet, at all times. It is a slow grower. Propagate by spores. Polystichum macleae is confined to the Drakensberg Escarpment and Wolkberg in Mpumalanga, occurring at elevations ranging between 1 350 and 1 960 m. It usually occurs in evergreen forests, but at higher elevations it is also found in the lee of large boulders. As a result of the decumbent, sparsely branched rhizome, it often forms small clonal stands resulting in a shrubby growth form. This is the only South African species with 1-pinnate leaves. They are mid- to dark green and can grow up to 1.5 m long. This very attractive species is worthy of cultivation. The species is best cultivated in light shade and requires permanently moist conditions. 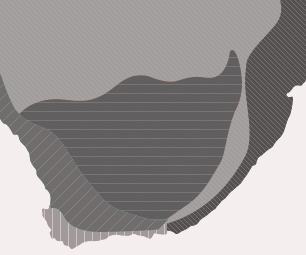 Propagate by rhizome division. Polystichum monticola is confined to South Africa, extending from the Kamiesberg in the Northern Cape, through the Western and Eastern Cape, KwaZulu-Natal and the Free State, to Lesotho, occurring from 600 to 2 740 m. The habitat includes seasonally moist, evergreen forests, rock crevices, cliff bases, stream banks, and forest margins, often growing in exposed, seasonally xeric conditions. The rhizome is decumbent and closely branched, resulting in plants forming a shrubby growth form. This variable and predominantly high altitude species is ideally suited for garden cultivation. The arching leaves are mid-green in colour and up to 0.8 m long. Although the species will tolerate some sun once well established, it is best cultivated in moist conditions in light shade. The species is slow-growing, and propagation is best done by rhizome division. Polystichum pungens is restricted to South Africa and Swaziland. In this region it ranges from Table Mountain, along the southern mountain ranges, and the Drakensberg foothills to the Wolkberg in Mpumalanga. It occurs at elevations ranging from 600 to 1 350 m and is restricted to forests. The rhizome is decumbent and regularly branched, resulting in the plants forming clonal stands and a shrubby growth form. The leathery leaves can be up to 1 m long, are dark green, and suberect to arching. The species is best cultivated in moist shaded conditions, but will tolerate morning sun once well established. Propagate by rhizome division. Polystichum transvaalense is widely distributed in temperate and tropical Africa. In South Africa it occurs from the Drakensberg foothills in the Eastern Cape along the KwaZulu-Natal Drakensberg escarpment, the Eastern Cape and southern KwaZulu-Natal midlands, the Free State/KwaZulu-Natal and Mpumalanga/Limpopo Province escarpment to the Soutpansberg, with outlying populations in the southern Cape mountains. It occurs at altitudes ranging from 365 to 1 840 m and is confined to forests. It has a short, erect, usually unbranched rhizome and a tussock-like growth form. In suitable conditions the suberect to arching pale- to mid-green leaves may be up to 1 m long. The species is suited to be used as a focal point in smaller gardens and should best be cultivated in light shade, preferring moist conditions. The species is worthy of cultivation because of its neat appearance. Propagate from spores.